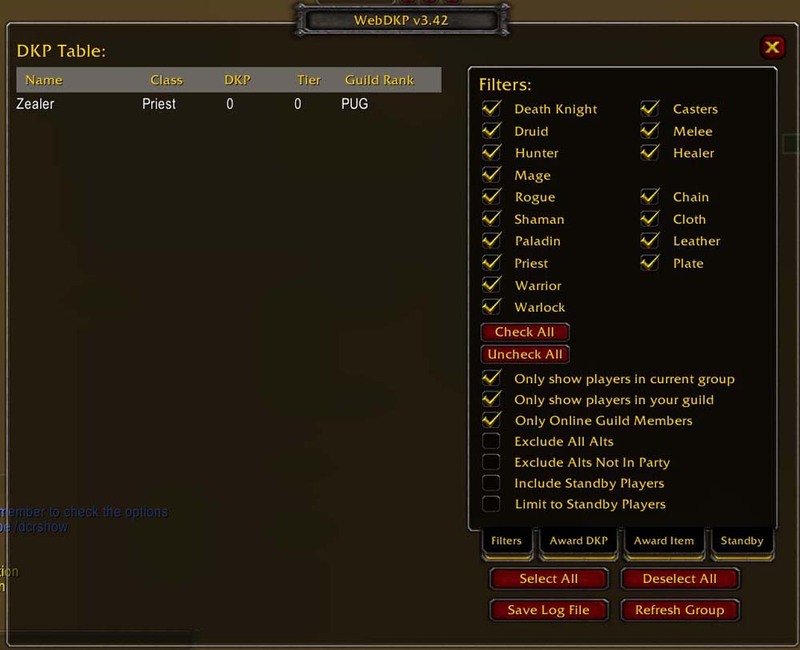 Check out the WebDKP Tutorial to learn how to use the addon and upload to the site. You can also check the Forums. Is the addon missing a feature you want? Please post your suggestion(s) in the forum! Check out the Forum. - Fixed a loot table bug. - Added Cataclysm Auto Awards. - Fixed an autoaward bug. - Fixes for bidding which was screwed up with the item level mult code. - Fixed a few small things. - /main and /greed no longer require a value to be accepted, it just defaults to 0. - A new button in the bidding window to list the top 3 bidders. - Fixed several potential bugs and sorting in the award log. 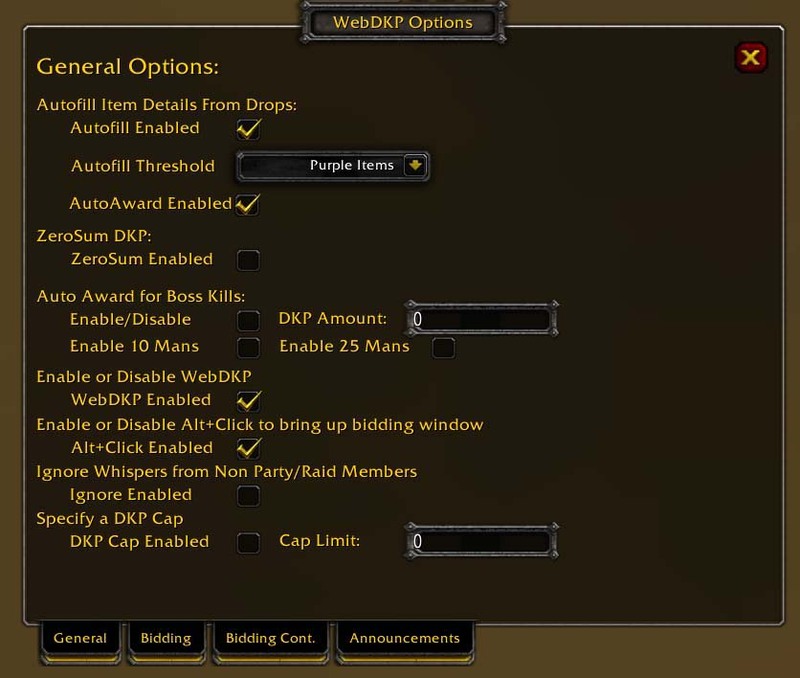 - Option to ignore WebDKP whispers from people outside of the party/raid to minimize spam of DKP info. - When someone rolls now, it will display their total DKP instead of 0. - Changes to the auto award for boss kills, should show the proper encounter in the award log now. - An online filter for guild members, Unfortunately this only works for guild members, it will not show online status for non guild members. - The Guild Rank has been added to the bidding window. - There is now an option to disable the Alt+Click feature. - You can now specify a % amount for !greed which is based on the loot table value or their total DKP if the loot table is blank. - Monitoring rolls during bidding should now be fixed. 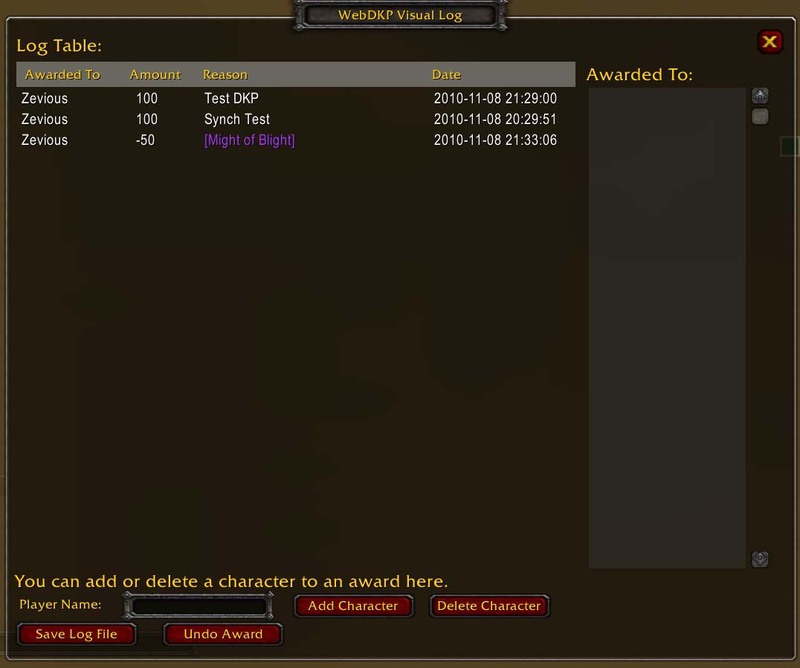 - Fixed the in game DKP table synching issue where it doesn't transfer Death Knight info. - Believe the auto award for Valithiar Dreamwalker encounter is fixed.